The third Dark Arts Books release is now available and spotlights the deadly, seductive lures of four amazing writers. 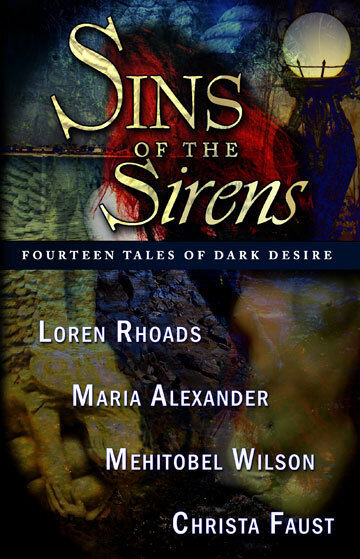 Sins of the Sirens was released on January 10, 2008, and features new stories and rarities from Maria Alexander, Christa Faust, Loren Rhoads and Mehitobel Wilson. The largest Dark Arts collection yet, this anthology features 20,000 words of fiction from each author, including “Firebird” an original novelette from Christa Faust! 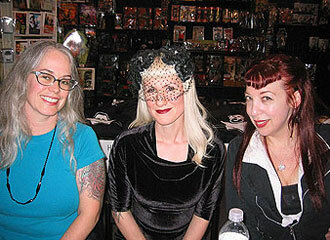 Loren Rhoads, Christa Faust, Maria Alexander at the SINS OF THE SIRENS signing at Dark Delicacies Bookstore. When you order a physical copy of Sins of the Sirens, you can also get a free e-book version of the book. Click the Add To Cart button above and answer the question during the PayPal shopping cart checkout process and we’ll send the e-book version your way when we ship the paper copy!